Thank you Dave Stevens for creating such an incredible character. If you want to see a few of my roughs for this piece CLICK HERE. You brought a terrific Chaykin quality to this. Patriotic pulp at it's finest! This is really sharp, and I love the inks as well. Heading over to check out the roughs... now! That's so dynamic. I love it! I can actually see how he would sputter in motion Andy, awesome job!! I'm a huge fan of statically depicting dynamic movement. Fantastic inks, Andy. That's a great pose and the whole design is just really effective. Like everybody has said, I love the energy in your inks. I really like how the gun's muzzle flashes and the jetpack flares simulate fireworks to help punctuate this patriotic image. Hells yeah!! This really has a zing to it!! The Chaykin comparison hit me as well. 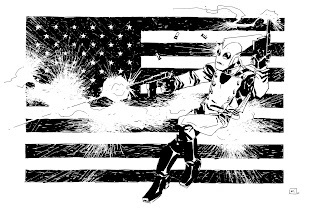 The image could have been taken from a team-up in American Flagg. I'm also digging how you ditched grace in favor of the bombast and crackle of having a rocket on your back.